What Do Hermit Crabs Look Like Without Their Shells? A hermit crab grows by molting his old exoskeleton, during which time he’s out of his shell and vulnerable to predators. As a defensive mechanism, hermit crabs often isolate themselves and hide during the molting process, which means it's a rare and fleeting sight to glimpse your hermie outside of his protective shell. A hermit crab displays a hard exoskeleton body, head, legs and pincers extending out from his conch-like shell, while the lower portion of the crab is tightly hidden away inside. The lower abdomen is composed of a soft yet muscular tail that wraps into the shell's concave interior to keep the crab secure and safe from harm. The lower portion of his body is not protected by an exoskeleton and somewhat resembles a shrimp tail. 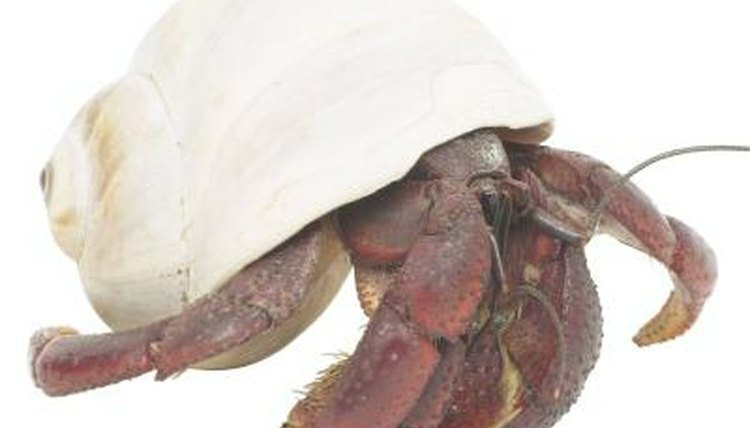 While a hermit crab’s hard body coloration may range from grayish green to red, the tail section is usually a grayish pink hue. When a hermit crab molts, he sheds his exoskeleton and pulls his body deep into his shell while he regenerates a new hard exterior. Prior to molting, your hermit crab may venture out of his shell and soak his tail in water, which helps him stay hydrated and allows him to expand the old exoskeleton, making it easier to slough off. Some signs of impending molt include reclusive behavior and a propensity to spend more time than usual in a water dish. A hermit crab may keep his old shell following his molt, but if he has grown significantly larger, he will look for a bigger shell to inhabit. It's important to keep a collection of different sized shells in your hermit crab’s cage to ensure he has a variety of homes to choose from. A hermie does not like to be out in the open for long, so if you do catch him changing shells, it will be a quick transition from one shell to another. His legs will drag along the soft tail part of his abdomen and he will insert his lower body into the shell before situating the upper two thirds of his exoskeleton on the outside, pulling his legs into the shell and “sealing” the entrance with his largest pincer. A hermit crab is vulnerable before, during and after molt, and when moving from one shell to another. If your hermit crab is out of his shell for an extended period of time, even though he has adequate choices of different-sized shells, it could be a sign that he's sick and needs medical attention. Some hermies will molt while still partially ensconced in their shells while others fully extract themselves for the molting process. The shed exoskeleton looks very similar to a lifeless hermit crab body, so don't throw away your crab thinking he has died. Rather, leave the exoskeleton in close proximity to the shell, as your hermie will eat it as a calcium supplement after he regenerates a new exoskeleton.